Teachers have an important part in your kids' lives. You probably want to show them your appreciation and to make sure they know that they DO make a difference. Teacher gifts can be a great way to show them how thankful you are for their hard work. These six teacher appreciation gift ideas are practical and touching in their simplicity. They're all useful gift ideas any kindergarten or elementary school teacher will be more than happy to use in her/his classroom. Finger puppets are great teacher gifts. The teacher can use them to turn any children's story into a live puppet show and to sing a song with the kids in an active vivid way. The kids can play with them, develop their story telling and drama skills and to develop their imagination. Here are some free patterns of animal finger puppets you can download for free (you'll need to sign up first). You can glue the different parts instead of sewing them. patterns for 18 different animal finger puppets . You'll need to pay for the patterns but they cost less than 5$, they are so cute and super easy to make. All you need to do is cut the parts and glue them. Even non-crafty people like me can make them! download the patterns for free . This is a sewing project but you can sew the body and glue the other parts for the easier version. Teachers often purchase special treats and reward items to give to the students that perform and behave well. You will find that one of the most unique teacher gifts you can buy is a jar full of treats and rewards that the teacher can hand out to the students. You can find a number of small items – like stamps, stickers, lollypops, small bubble soap tubes and mini candy bars at your local dollar store. 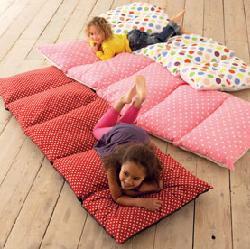 These pillow mattresses make great teacher gifts. The teacher can put them in the reading area and the kids can use them for reading, playing or whenever they feel like they need a little rest. multi-use wall - the kids can draw on it with chalks, to play with magnets and to hang their art work. The teacher can use different magnet sets as teaching tools like numbers or letters, use it for a group project to teach the kids about team work and for other educational games. Talk to the teacher (or the principle) and ask for permission and for the preferred wall to paint. You should apply at least 3 layers of magnetic primer and 2 layers of chalkboard paint and the magnetic primer is a bit expensive. I suggest that you team up with other parents so it won't cost more than you planned. Instead of painting the wall you can get a big metal board (check first that it holds magnets), paint it with chalkboard paint and hang it on the wall. That way the teacher can take it with her to another class at the end of the year and it won't "harm" the walls. Most classrooms have many things that need to be stored - craft supplies, old magazines, dolls, costumes, games… These things are used on a daily basis and need to be handy and reachable for the teacher and for the kids. If you're looking for practical-useful teacher appreciation gift ideas, a big storage box (or a set) is your perfect gift. 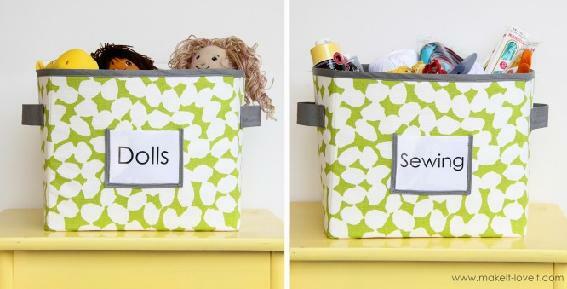 Here is a great Fabric Storage Boxes tutorial from Ashley's blog - "Make It and Love It" – Thanks Ashley! Teachers have very low budget for office and craft supplies. So - if you're looking for a gift that teachers will consider as one of the best teacher appreciation gift ideas you should get them some office supplies. You can join forces with all the parents in the class and make your teacher pleased as punch with a really nice present!